New Winter 2018: Here's a lovely gift idea for the holidays, birthdays or Mother's Day! 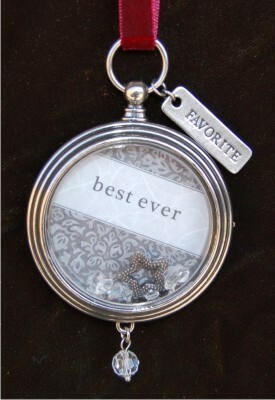 The best ever keepsake locket for friends & family Christmas ornament is made from pewter with a metal Favorite tag attached. Crystals on the glass window and beneath catch the light and attract attention to the family or friends inside the locket. This is one of several frame ornaments we carry, and you'll find them for kids, friends, family and other special people in your life. Share family love or friendship this holiday season or any time of the year with the pewter locket friendship ornament in our plush velvet gift bag. For my best friend of 44 yearts... Nov 3, 2017 Sherry T.